Photo from YarraBUG's Gipps Street Steps Campaign held March 20th, 2005 during Bike Path Discovery Day. Status: Still bloody waiting! getting closer. Listen to Yarra Bicycle Users Group Radio, broadcasting every Monday at 10-10.30am on 3CR Community Radio 855am + Digital and streaming live on the web at 3cr.org.au. YarraBUG Radio explores all the best things about being on a bike. We talk to the people organizing the fun, designing bike fashion, turning the pedals, writing the books, nerding out about groupsets, singing out loud at the stop lights, designing and building your local infrastructure, racing around in circles or up really big mountains, eating the cheese, tweaking and testing and writing the poetry. Presenters are Chris, Faith, Val and Steve. The Yarra BAC aims to give local residents an opportunity to provide regular input to Council on the development of the local bicycle network and other bicycle infrastructure in Yarra. Membership is open to any member of the Yarra community with an interest in policies related to cycling and the development of the local bicycle network. Yarra Council representatives on the committee are Cr Mike McEvoy, Cr Jackie Fristacky and Cr James Searle. All meetings are held on a Wednesday in the Wurundjeri Room, Collingwood Town Hall, from 6.30pm to 8pm. In June 2014 you may recall the community pressure that helped retain funding to help proceed with a bypass to riding through the underpass at Rushall Station. Yarra City Council is currently seeking community input on a proposal for a Shared Path through Rushall Reserve linking Rushall Train Station to the existing path at the end of Holden Street, North Fitzroy. East West Link – cutting Yarra cycling routes in half? November - December 2013 Wellington Street 'Copenhagen Lanes' - We need people to contact all Councillors - especially those who voted against Wellington Street Advisory Group recommendations. Tell your story why you want these lanes, why they are important to you, your stories of riding through the area, especially if you live locally. If you're interested in finding out about YarraBUG's prior advocacy work, please feel free to register and read our email archives - yahoogroups (2003- 2007) and email archives - mailman (2004- current). 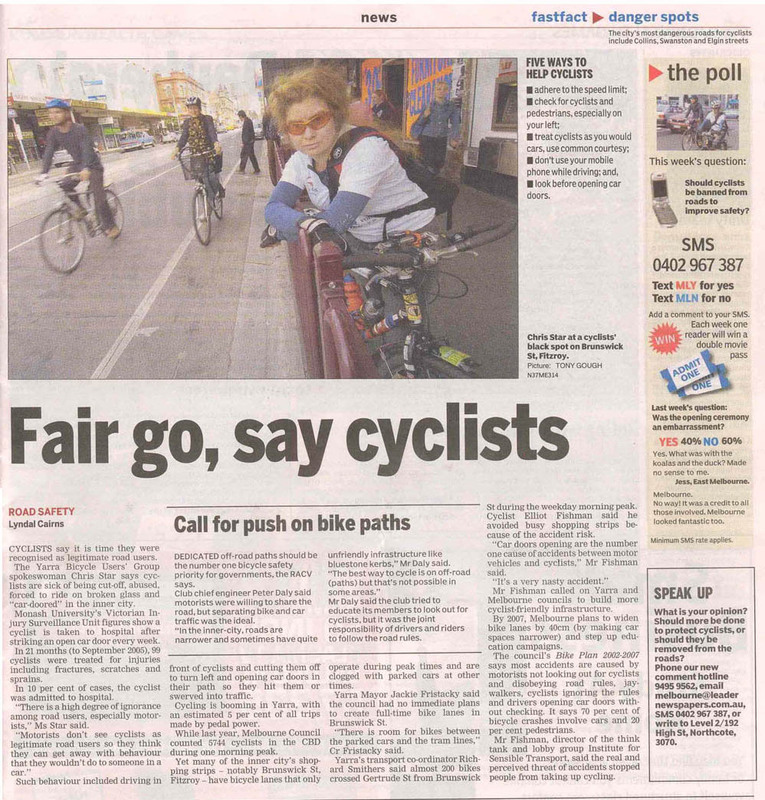 Please contact us if you have any originals of news articles that related to cycling issues in Yarra. Riding to Work is faster and more fun! Listen here for the Great Commuter Race (17/11/05) between bicycle, car and bus, as part of ABC 774 Melbournes Transport Blitz on Jon Faines morning program. And the winners were, of course, bicycles! YarraBUG participation at the City of Yarra Bicycle Advisory Committee :: 2005 :: 2006 :: 2007 :: 2008. See below for other campaigns details involving participation with the City of Yarra. March 2008: Letter of Support to Melbourne Council in regards to improved bicycle parking at Lygon Court in Carlton and response from Cr Catherine Ng. February 2008: Community Coalition for the Darebin to Yarra Link Trail: Press Release (27 /2/08) In 2005, a number of diverse community groups formed a Community Coalition with a common goal of â€˜actively lobbying for completion of the missing links in the Darebin â€“ Yarra trailâ€™. The coalition has since expanded and now represents a range of interests in the shared trail, including local bushwalkers, environmental groups, recreational and commuter cyclists, and schools. September 2007 - Ongoing: City of Yarra: Planning, Environment and Infrastructure Committee (Nov 07): 4.3 Support for Bicycle Riding. (Refer to pages 20-25, pdf file, 15M) This motion developed as a result of discussions at the YarraBUG Public Forum and is still before council. Click here for a extract from the CoY Planning Agenda. April 2007: Shared Path problems on the Linear Park Reserve in Carlton North: Public Question Time at Moreland Council Meeting April 11th 2007. June 2006: Submission to City of Yarra regarding cyclist safety issues at Pigdon and Canning Street Roundabout. June 2006: Merri Creek Review: Combined Submission from DarebinBUG, BrunswickBUG and YarraBUG. Also refer to CoY Inner Circle Railway Linear Park Reserve Conservation Management Plan and Draft Linear Park Master Plan.